We were saddened to learn about the sudden demise of our Randonneur Victor Wong. It is very sad to all of us who have had contact with him. Victor was a real Randonneur, he enjoyed every BRM he participated. I remembered him as always riding slow and steady, in his T shirt and Crocs. It is a great loss to ARM and all Randonneurs. Victor had registered for the coming BRM300 in Bukit Mertajam, but he could not make it on that day. This is the ride where we pay our tribute to him. We also hope that this ride will create awareness of personal health condition among all cyclists. ARM will take out RM5 from each participant fees as a small fund for the family. See you on May 12, 2018. We have 108 participants for the coming BRM300 and we decided to take out RM5 from each registration fees. This will be an easy warm up ride from Autocity (Butterworth) until Kulim Hightech, from 27km it will be no street light along the road and need to pay more extra caution on the road surface. We stop at Selama town at 48km for bfast. (along the ride there will be no stall or shop open due to too early), there will be a Chinese shop and Malay stall side by side, Malay stall open at 6.30am. If you only need a very short rest, refill water or toilet break, proceed further another 2km you will arrive Selama Caltex, recommend to stop here before proceed for S4 and Sumpitan Climb. S4 Climb will start at 63km, as the name go there will be 4 small dragon back climb, after the climb you will arrive at a small town at 75km, refill and short break is possible here. There will be a few mini market in this area. Further up will be the main climb for this route (Sumpitan Climb). Once you enter the climb area, there will be no shop along the road until CP1 (about 30km). The climb will be easy at front and hard at the back. After you pass the waterfall bridge, then the more challenging part will start. Positive point is it will be cover by tree and the time still not so hot. 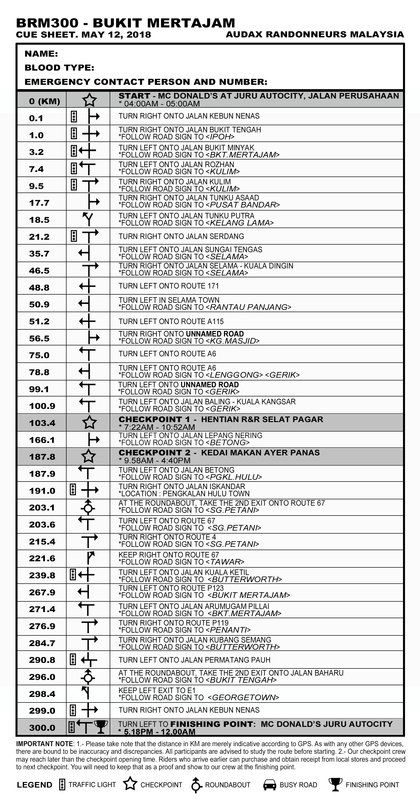 Downhill will fast and after arrive at main road (Jalan Baling-Kuala Kangsar) CP1 (Hentian R&R Selat Pagar) will be about 3km away. There will be a Malay stall selling food at the CP1 (R&R), the food might be limited to all but we do inform them to prepare more on our BRM300 day (Hope will be enough to all). This 100km will test our mental on rolling and heat, along the route after CP1 there will be very limited shop for refill until Gerik. It will be a rolling ride, but no worry the rolling on this part is not so hard. At Gerik (143km) I will suggest to refill and lunch here because further up will be limited place to do that. The real challenge (very depends on the mercy of the weather), after you turn in to Jalan Lepang Nering (a road sign asked to turn to Betong), the dragon back there will be like never ending, the road will be very less car and road condition will be good. This 21km really was mentally challenging, No shop along this road until almost the end, you will get a mini market (Kampung style) and food at the end of the road where CP2 is. This will be easy ride because it will cover mostly downhill or flat road, but pay more attention on the road condition especially the downhill part from Baling, it will be fast and road with a lot of pothole, beside the road is busy with downhill cars. It was rain when we at this part and there is one place all car stop because the road (Crank level) is flooded but we still ride thru the flood and everyone is looking like emmm, (sorry, is too far for us to U turn) I hope it will not rain when BRM300 (Maybe not at this hour). Just make sure front and back light is enough power and will be no issue until Finish Point. Ya, before I forget, we do chase by a group of stray dog (279km), out of sudden I feel like im Peter Segan and sprint the last 100m finish line , We manage to finish the ride 45minutes before the cut off time. So how many star I will rate this route, I will rate it 3.5 stars or 3 stars if weather is good.